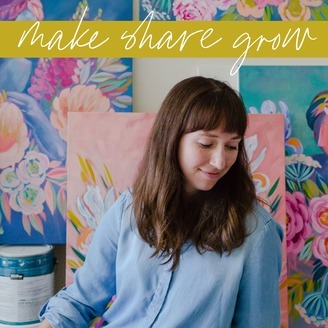 MAKE SHARE GROW is a podcast that shares behind-the-scenes stories about art, craft and the creative process. 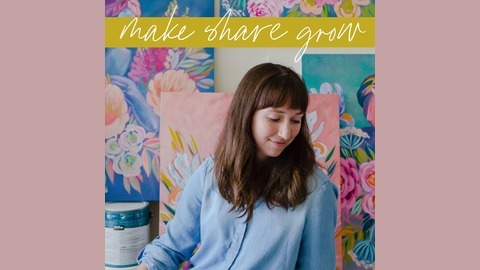 I share the details of my painting process, the inspiration behind my art, the story of how I found my creative voice, my favorite art supplies, and more! Whether you’re a creative entrepreneur, someone who loves to create in your spare moments, or someone who’s just curious about this whole “art thing,” I hope there’s something delightful and inspiring here for you! —Julie Marriott. We’ve come to the final episode of Season 2 of the podcast! Today’s episode is a special Q&A show where I answer your questions about my art practice, business and life. I share some practical tips for how I fit art into my life as a mother, how I keep inspired while creating, my top suggestions for using Instagram for promoting your work, and more!